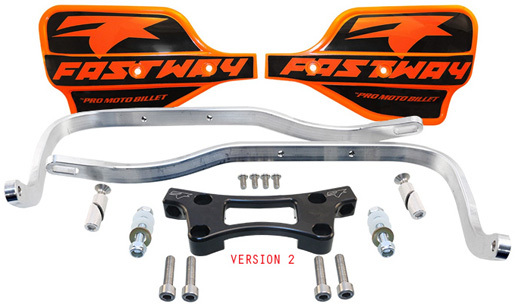 Fastway Integrated Technology (FIT) System Handguards offer a strong, innovative method of mounting handguards to almost any dirt bike and some ATVs. The unique handlebar clamp mounting system eliminates cable, brake hose routing headaches and helps prevent the handguards from twisting on impact. 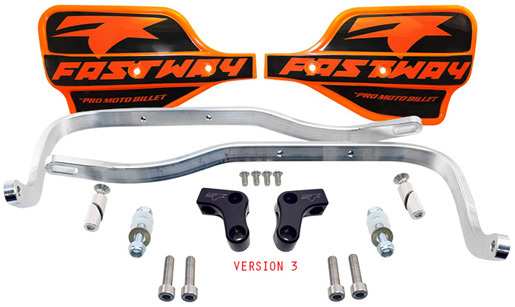 Fastway FIT Version 1 handguards provide an adjustable mounting point for Fastway System 3 and System 5 above bar steering stabilizers. v1 FIT systems are also compatible with Scotts and GPR above bar steering stabilizers. The adjustable Damper Mount allows for proper stabilizer mounting position in all OEM handlebar settings. FIT v1 and v2 handguard systems are available in 90 x 40mm, 96-100 x 40mm, and 100-106 x 40mm bolt patterns to fit most fat bar applications and 100 x 33mm, and 106 x 33mm bolt patterns to fit most 7/8 inch bar applications. Version 1 kit includes top bar clamp with integrated handguard mount tabs, adjustable damper mount plate, anodized clear or black handguard bars, mounting hardware, and a set of shields. *All Black kits are a CycleBuy creation and cannot be ordered from other from PMB or other vendors. 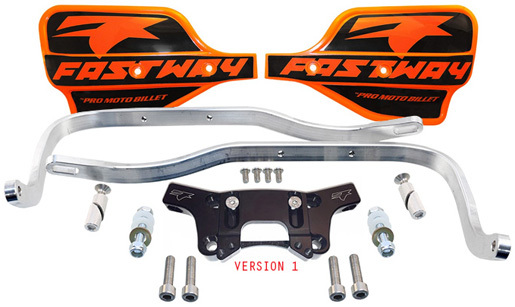 Fastway FIT Version 2 handguards provide a solid billet aluminum top bar clamp with integrated hand guard mount tabs for a rigid and clean mounting system. Keeps cables and brake lines from interfering with guards and impact deflectors from twisting upon impacts. 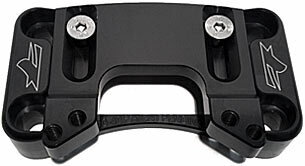 The solid top clamp provides extra support for bikes with rubber mounted bar clamps that twist easily during crashes. Version 2 kit includes 1-piece billet aluminum bar clamp, anodized clear or black handguard bars, mounting hardware, and a set of shields. Fastway FIT Version 3 handguards offer more versatility than v1 or v2 systems. The individual left and right bar clamp/guard mounts allow this system to fit varied applications, regardless of left-to-right bolt spacing. For KTMs and other bikes with solidly mounted bar clamps, we recommend the v3 system as there is very little strength advantage to using the solid top plate offered in the v2 system. For Hondas, Yamahas, Kawasaki, and other bikes with rubber mounted bar clamps, we recommend the v2 system with its solid top plate. FIT v3 handguard systems are available in 40mm bolt spacing to fit most fat bar 1 1/8 inch applications and 33mm bolt spacing to fit most 7/8 inch bar applications. Version 3 kit includes black left and right bar clamps, silver or black handguard bars, mounting hardware, and a set of shields. 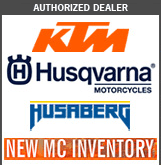 ** Older Husqvarna models with angled bar mount bolts cannot use any of the FIT systems. FIT Steering Damper Mount Plate was specifically designed to the fit the Fastway System 3 and System 5 Steering Stabilizers. It mounts directly to the top of the handle bars for a clean and perfect fit. (Also fits Scotts, Ohlins, and GPR Steering Stabilizers. Specifically designed to fit Fastway System 3 and System 5 Steering Stabilizers. Will fit a Scotts, Ohlins, and GPR Steering Stabilizers. Available for 7/8" standard bars and 1 1/8" fat bars. To ensure proper fit, it is recommended that you obtain your handlebar mount/clamp measurements before ordering. For help obtaining these dimensions, see the Top Clamp Measure Diagram. All FIT Handguards mount to Pro Moto Billet/Fastway patented center clamps. This means there is no clutter on your bars and makes it simple to hook your tie downs or soft ties to your bars when loading your bike for transport. 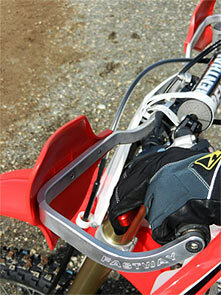 The patented mount also helps prevent the handguard bar from rotating up or down in the event of a crash. The result? Rock solid protection! You asked, we responded. More room added in the cockpit, a deeper safer U bend, rounded the impact face for better narrow-tree deflection, and added a deeper drop down for better cable clearance. Fastway FIT System handguards are the strongest and best in the industry. Made Pro Moto Billet Headquarters in Idaho. DO YOU LIKE FLEXX BARS? So do we. The patented mounting maintains the flex in your stock bars, and works great with Flexx bars. We should know - we run them!